It’s the final day of the Reaching Out 2 The World trip. 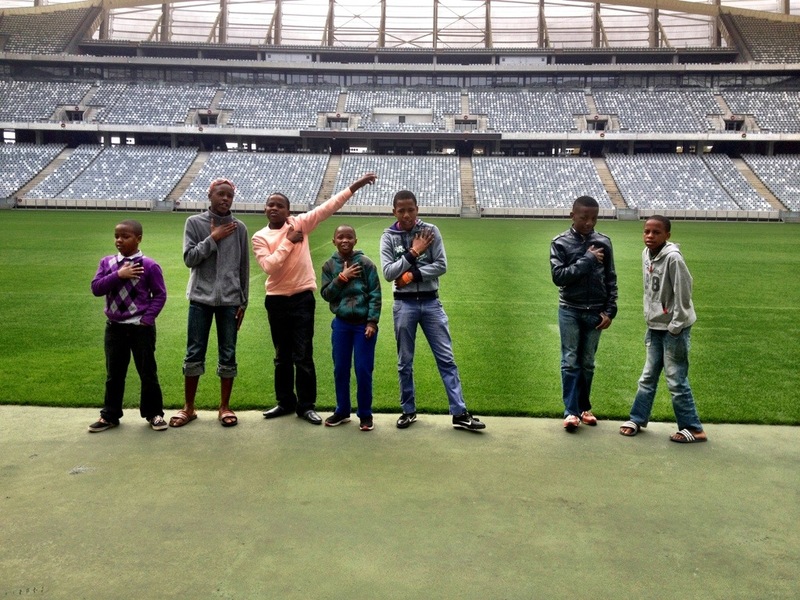 Today, Hotspots booked a tour for the kids at the Cape Town soccer stadium! 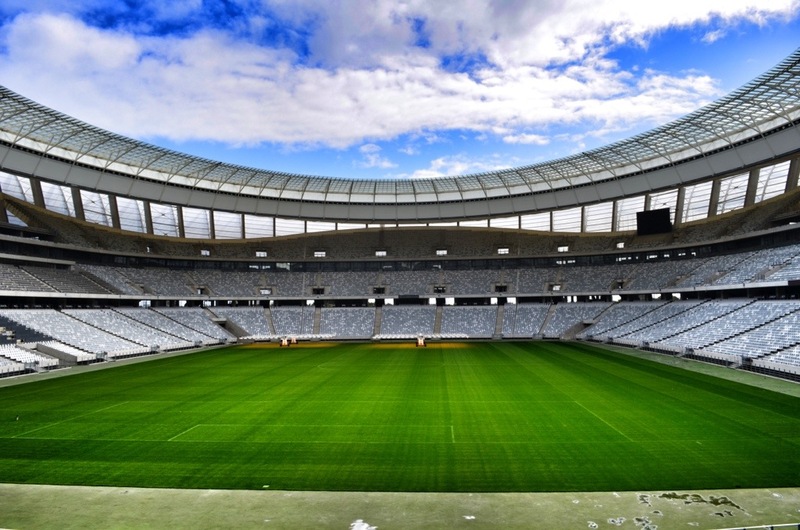 It’s now well known for being one of the venues for the 2010 World Cup that took place here three years ago. 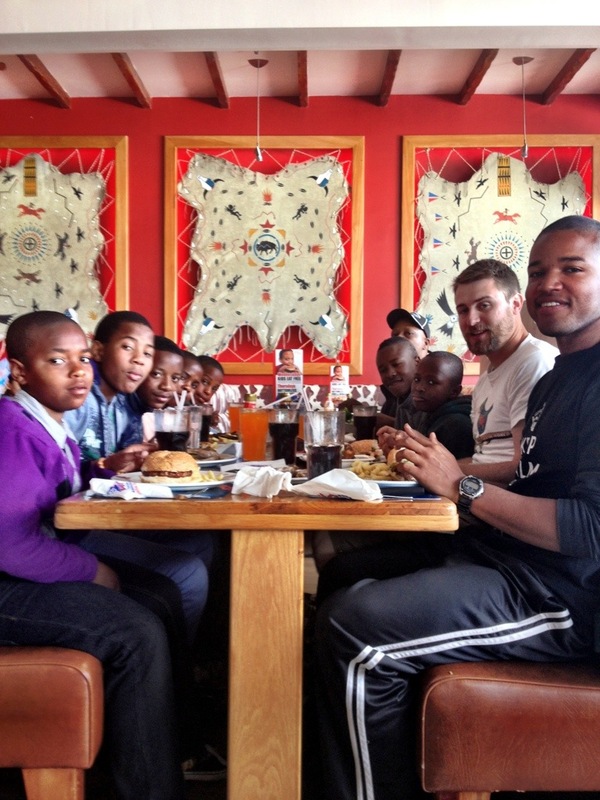 All of the kids arrived to Zulu’s in the morning just like we’d asked except for Avele and Aphiwe. We got word that Avele was feeling ill and wouldn’t be able to make it. But where the heck was Aphiwe? We always warned the kids that if they were late then we will have no choice but to leave them behind but when it came down to actually doing that, we felt kinda bad. Chris called Aphiwe’s mom to find out where he was but she wasn’t very clear about anything. Isaac was kind enough to take us to Aphiwe’s home to see if he was there and thankfully we decided to do that! Aphiwe just overslept and was running late but jumped right into the van once we knocked at his door. Once we had everyone, we made way to Cape Town! It takes anywhere from 35 minutes to an hour or so to get to Cape Town from Stellenbosch. Depends on the driver, the route, and the traffic. On the way to Cape Town, there is this amusement park with a giant roller-coaster beaming outwards. We always pass it by whenever we pass from Stellenbosch to Cape Town. I plan on taking some of the kids here when I get back from Morocco. 🙂 We pulled up to the bowl-shaped stadium and found that we arrived early and were some of the only people there. 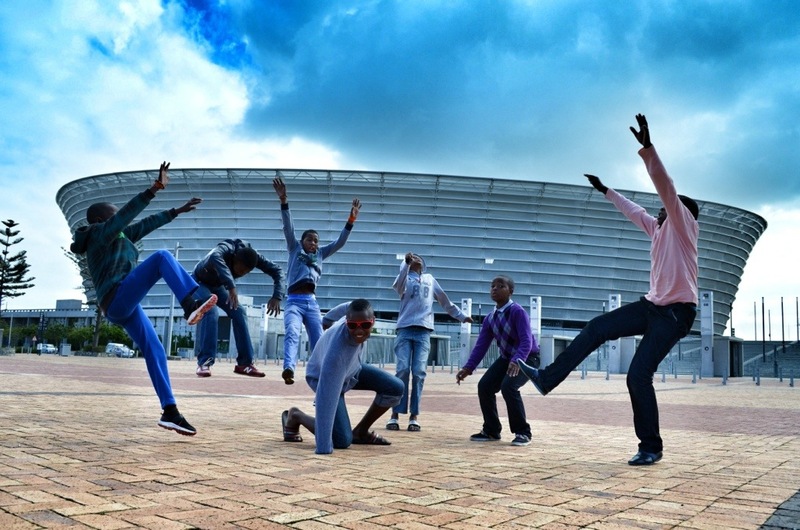 We took this opportunity to take some pretty awesome photos, right outside of the famous stadium. The kids love taking pictures of themselves and were more than happy to take part! After about a half-hour of goofing around, the tour finally started. We were virtually the only ones in the stadium minus a few Dutch girls who joined in on our tour. Our tour guide first took us to the main seating area of the stadium. 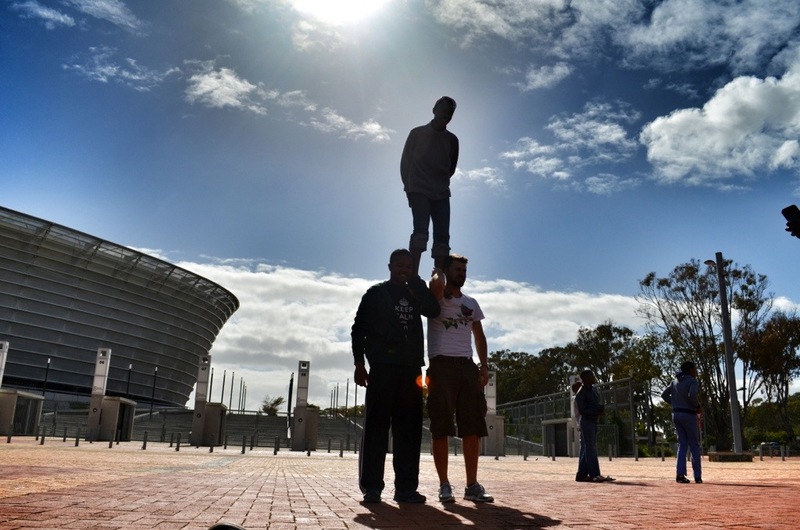 Cape Town stadium can hold more than 65,000 patrons at once! Besides soccer matches, a lot of different concerts have taken place here. As a matter of fact, Rihanna is scheduled to perform here sometime within the next couple of weeks. There were two elongated beams emitting light onto the field that acted as “sunlight”. I always thought the stadium was just turf but it’s actual real live green grass. Most of the boys have never been here before and immediately wanted to take pictures with the field as their backdrop. 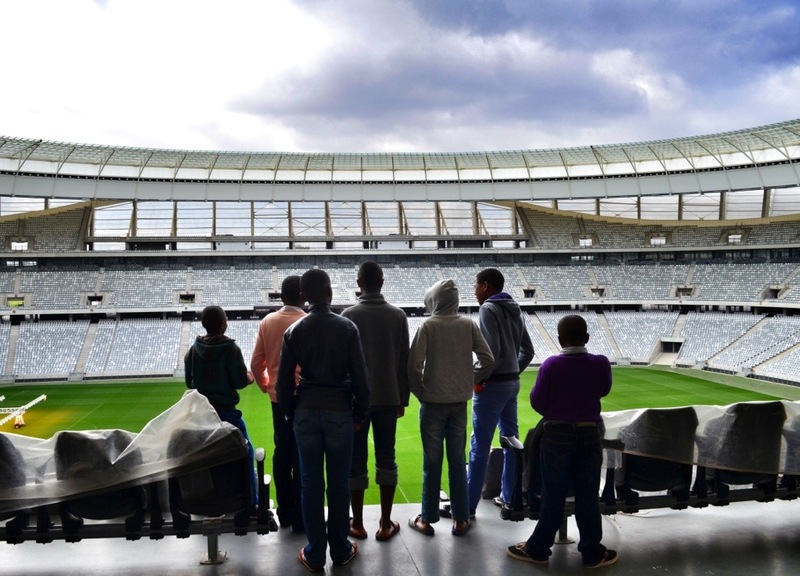 On our tour, we had access to V.I.P and other restricted areas, each with different views of the playing field. 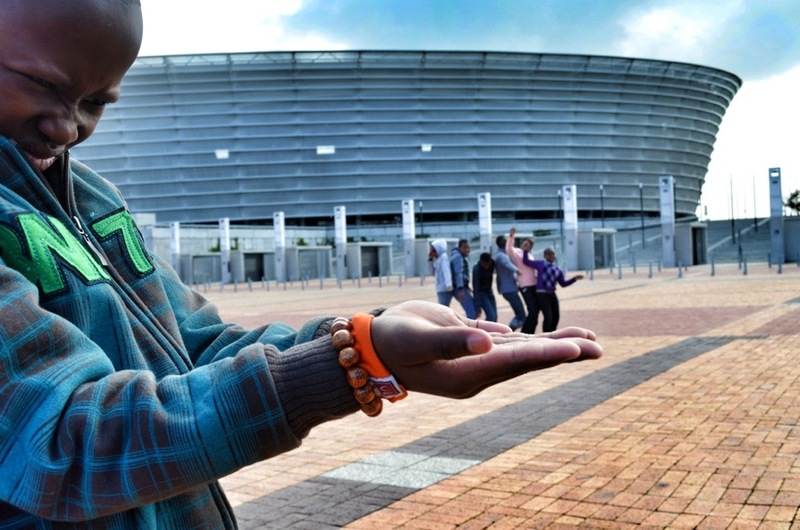 The guide told us that the stadium costed 40 million rand to build and they are completely debt-free, but there are tons of restrictions because of the zone the stadium was built in. We went through the halls in the corridor and into the main locker rooms soon after. I took a photo of the boys sitting on the benches in the locker room, but by the looks of this picture, I think they disliked guided tours as much as I do! We went down to the main floor of the stadium, the actual playing field. The guide told us to not go on the grass though. We went out the entrance to the field, the entrance where the players come out and are showered with cheers and cries from the fans. We thought it would be cool to film the boys coming onto the field, reminiscent of the soccer players. The Dutch girls clapped and cheered as they came through! 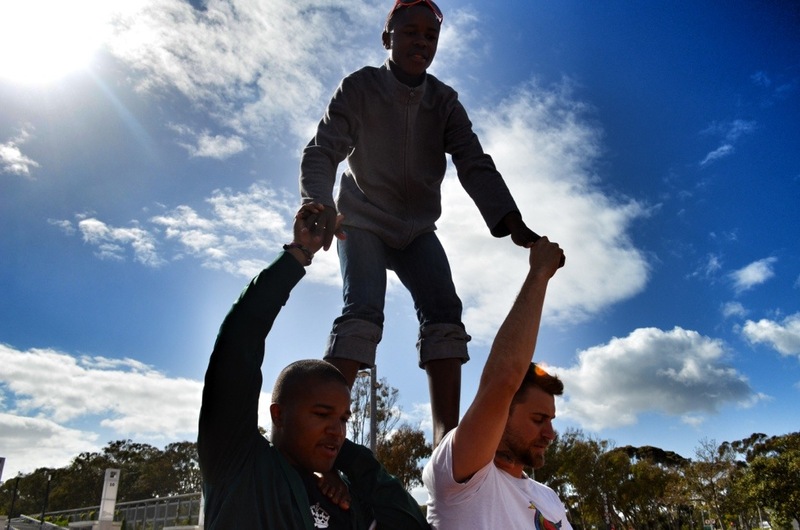 The boys lined up on the edge of the grass, put their right hands over their chest and started singing the South African national anthem. We have all of this on video and it will probably be included in the montage we make when we get back home. This was an excellent way to end the tour. We exited out of the ground floor and went back to the van. 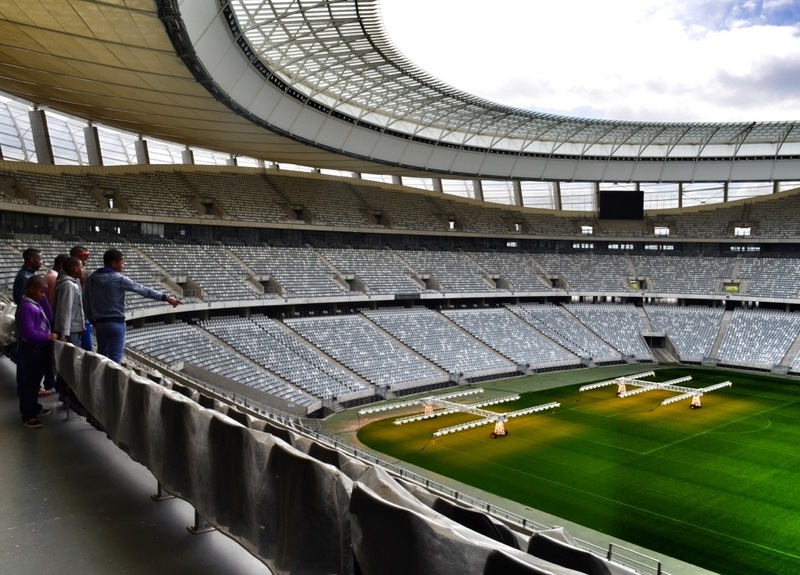 The itinerary today was only for the Cape Town Stadium, but Hotspots gave us such a great and unexpected discount that we decided to use some of the money we saved to take the boys out to to their favorite restaurant, Spurs. I knew there was one at the Waterfront nearby, so we went there. The main attraction of Spurs for them isn’t just the delicious ribs, it’s also the video games they offer for children…12 years old or younger! Yup, all of these boys were teenagers now, except for Lupho. And all of them were kicked out of the gaming area, minus Mawande who can pass for a twelve year old! 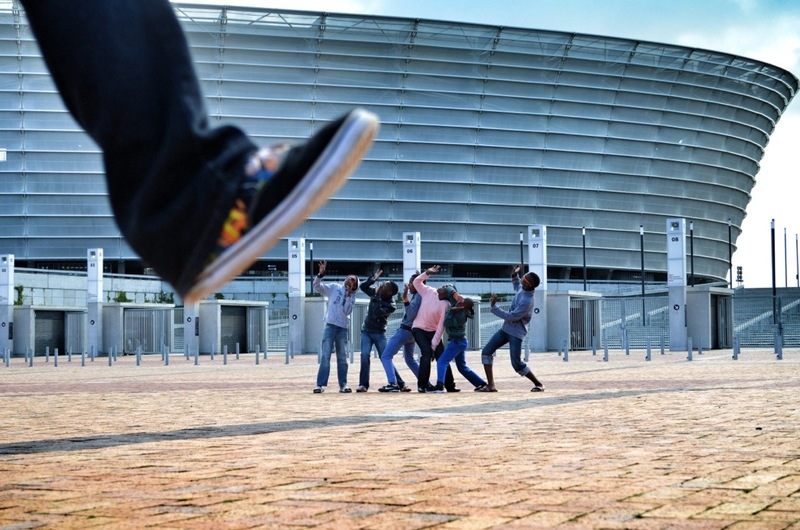 Aphiwe, surprisingly, wasn’t kicked out either. But no matter because we all had some great food coming to feast on! It was still early in the day, so we asked Isaac if he could drive us to Boulder’s Beach near Simons Town. 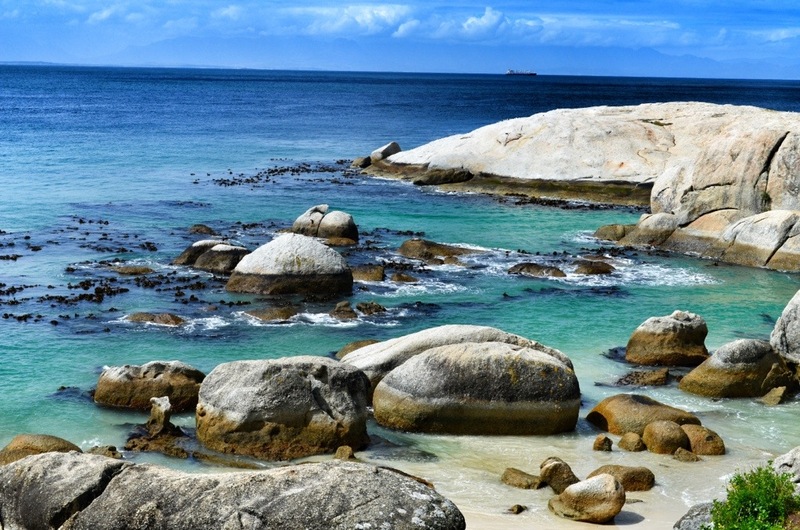 Boulder’s Beach is famous because it’s home to many South African penguins. We thought this would be cool for the boys to visit, in addition to the awesome beaches and landscapes you can see in the area. 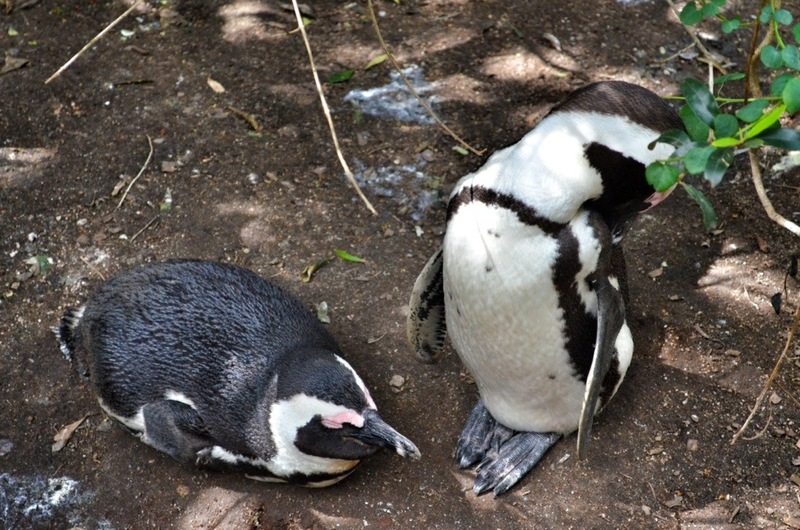 Once we got there, we walked along wooden walkway near the beach and spotted a few penguins waddling about underneath the shrubs. 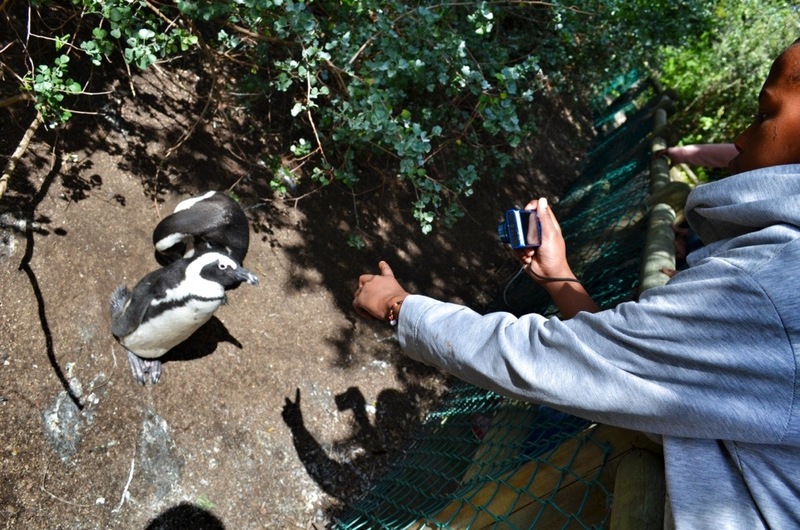 I was always told to never try and touch the penguins because their beaks are pretty sharp and they will peck at you! That didn’t stop Ski from pretending to try! At some points, there were blockades warning people not to cross over. Some of the boys crossed them anyways and wanted to take pictures. Part of me didn’t mind the boys breaking the rules because it’s sometimes fun to do. The other part of me didn’t want to pay the R500 fine for violating those rules so we had to have the boys get back quick before they were caught! We were able to chill for a bit here as we waited for Isaac to bring the van around and take us back to Kayamandi once and for all. Well that does it for the Reaching Out 2 The World trip! It’s been five incredible days of nonstop fun, excitement, and exploring for the boys. A big special thanks goes to Hotspots2c Tours for helping Chris and I out in such a big way! You guys made this easy for us to put together! Another big thanks goes out to all of our contributors who donated. None of this would have been possible without all of your generous donations. Taking eight kids to see and experience more of their country than they ever did in their lives was something truly magical! Chris and I are working on giving each of the boys photo albums with pictures of their trip in it. We are in the process of getting those together, and will give it to them just before we leave this country in November. We are also hard at work in delivering all of the perks we promised everyone. Some of you have already received postcards and to those of you who haven’t yet, don’t worry, we have been sending the cards out in waves. Some cards haven’t been sent yet because we don’t want to overwhelm the kids with writing loads all at once. If you do receive one, be sure to let us know! The other perks like the Earthbird shirts, special souvenirs, books, and collages will be sent out once we get back to the States. Again, thanks to everyone who was a part of this!